I’m sure, as a Disney fan, you know the legend of the Sherman brothers. They have given us much of the music that will live on forever in both our favorite movies and theme park attractions. Yesterday, the world lost Robert Sherman… a sad day for Disney fans world wide. 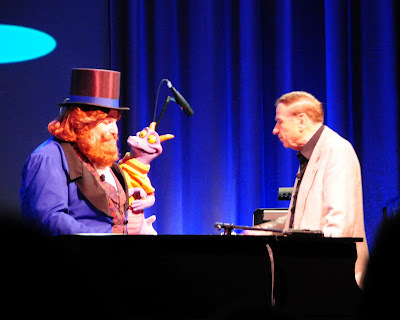 I consider myself incredibly lucky to have been in the audience a year ago at D23’s WDW 40th celebration where Robert’s brother Richard took the stage to play many classics’s from the duo’s catalog live on stage. Their music has touched all our lives. 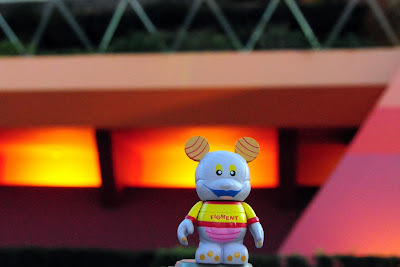 Interestingly, yesterday was the anniversary of the opening of Journey Into the Imagination at EPCOT. 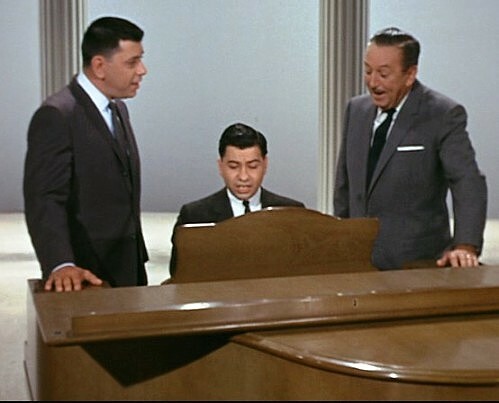 And that attraction’s theme song, “One Little Spark”, was penned by the Sherman Brothers. In honor of the attractions anniversary and the passing of Robert Sherman, Austin took the time to gather a history of the attraction for us and also found some “lost” verses of the song. on the northern-most banks of the Rivers of America it was to be the kind of place in which Mark Twain, Jules Verne, and H.G. Wells would cross-paths, and probably even call home, Discovery Bay would contain several attractions themed to technological flights of fantasy of the 19th century. The list of attractions contained in the new land were, a flight simulator on the Hyperion airship from Island of the Top of the World, an underwater restaurant where one could dine in the Nautilus while Captain Nemo plays his pipe organ, an elaborate- and thrilling – Spark Gap Electric Loop Coaster, and a carousel theater audio-animatronics tour de force “Gallery of Illusions” in which an eccentric professor shows off his latest discoveries and inventions. resurface time and time again in new and unexpected ways.Much of Discovery Bay’s “success” is attributed to the many ways it was recycled over the next two decades. The failure of this new land eventually “sparked” into the Coral Reef Restaurant at Epcot, the entirely new concept for then EuroDisney’s Tomorrowland renamed Discoveryland, and certain elements certainly would apply to the design of Port Discovery for Tokyo DisneySea. 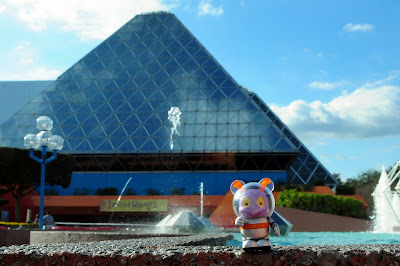 After working on a rejected approach for The Land Pavilion at EPCOT Center, Tony quickly turned his attentions to the Kodak pavilion next door. Kodak had only one request for their Future World exhibition, “They wanted something that would be very imaginative.” So we said: “How about doing a pavilion on imagination,” Tony recalls. Beginning to develop the ideas of such a vague notion as imagination was no easy task. “It was a fun time, and a real challenge, because we had to figure out what Imagination is. It took us six months to come up with a simple thing: “You gather, you store, and you re-combine.” Whether you are a writer, or a scientist, or an artist, or a teacher, or someone making a cake, it is the same thing: “gather, store, and re-combine.” The visual metaphor Tony used to convey this principle to the audience was an inspired invention known (unofficially) as a Dreamcatcher. “Essentially, the Dreamcatcher is a giant vacuum cleaner floating through space” said Steve Kirk, art director for Journey into Imagination. The Dreamcatcher flies through space collecting sparks and storing them in its idea bag, and some of those sparks are re-combined to create something new, in the case of our story; a literal figment of imagination. this project. 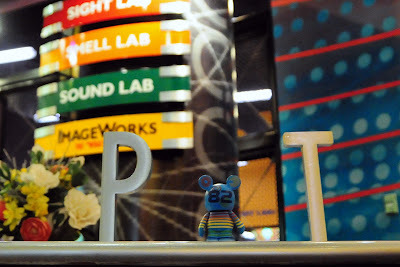 The rest of the Ride featured an exploration into the more creative endeavors of imagination: the [Visual] Arts, Literature, Performing Arts, Science and Technology, and finally Image Technology. time taken for the conversion between the original and second versions of the ride.Whether these are true or not, I don’t know but it’s always fun to speculate. 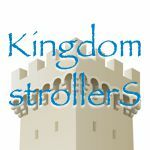 however, was modeled after Imagineer Joe Rhode who later oversaw the development, construction, and operation of Disney’s Animal Kingdom. Dreamfinder’s voice was supplied by comic actor Chuck McCann and Ron Schneider. 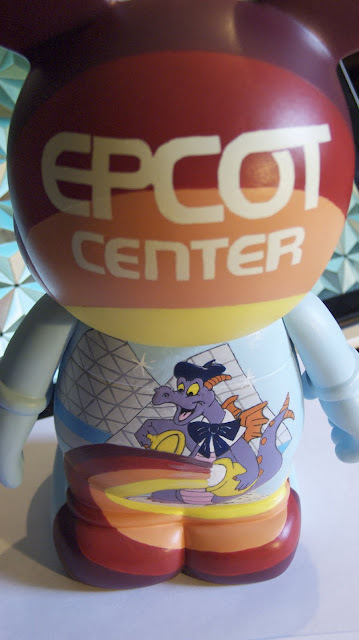 The voice of Figment was a little harder to cast. Imagineers tried men, women, boys, and girls even having adults inhale helium, but no one had the right voice. Until they found veteran performer Billy Barty whose voice was perfect for the 3 foot tall purple dragon. Well there’s the basic history of Journey into Imagination. Here are a few fun facts starting off with lost lyrics, and ending with specifications for the original ride. Like most songs, “One Little Spark” went through several revisions and had several verses written before the final version was settled on. And then, Eureka! – that little spark! Park 1 Figment, Park 5 Dreamfinder/Figment 9/3 combo and Park 7 Figment. There is of course also a Park Starz Figment already released and a Nerds Rock! version coming out soon. 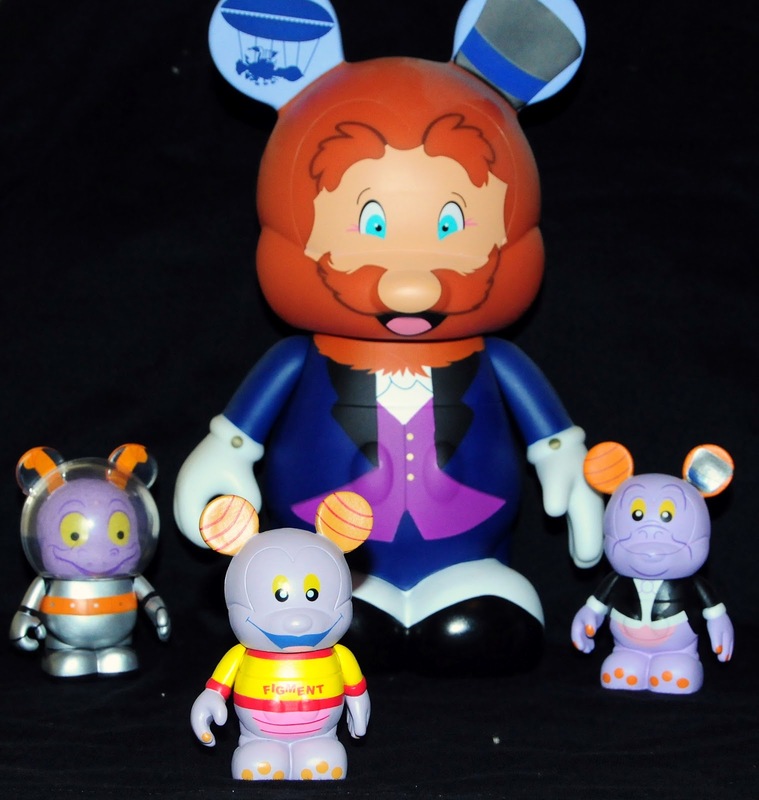 I would also be remiss to mention custom artist Justin Marshall who has an obsession with Journey into Imagination customs. Its a great loss.. may you rest in peace Robert Sherman! Rest in Peace Robert Sherman, you will be missed. Thank you for the amazing songs.